The Alabama Crimson Tide will face off against the Georgia Bulldogs in an all-SEC college football national championship game at Mercedes-Benz Stadium in Atlanta on ESPN at 8 p.m.
Alabama, the four point favorite, will face a team hoping to prevent the writing of the next chapter in coach Nick Saban’s dynasty. In the past seven years, Alabama has been crowned champions three times. The current Georgia team, coached by second-year coach Kirby Smart, is largely made up of players that Mark Richt, Miami’s current frontman, recruited. Richt was fired from Georgia in 2016 after 15 seasons with the Bulldogs, guiding them to a 145-51 record. The Bulldogs, the number one in the country entering November, saw their ranking plummet in the rankings after being outclassed by the Auburn Tigers, 40-17. Those same Tigers also handed the Crimson Tide, 11-1, their lone loss, via a 26-14 win in the anual Iron Bowl matchup. Many college football critics doubted whether Alabama would be placed in the final four, which they proved false, making Alabama the four seed.With that thought in mind, the players came out and made the number one seeded Clemson Tigers look silly and defeated them in the Sugar Bowl 24-6. The Georgia Bulldogs had a much tougher time getting into the national championship game, but did so nonetheless. The Bulldogs defeated the Oklahoma Sooners and Heisman quarterback Baker Mayfield in the Rose Bowl 54-48. The Bulldogs offense, led by freshman quarterback Jake Fromm and veteran running backs Sony Michel and Nick Chubb, rolled against the Sooners, and their defense led by Roquan Smith blocked a field goal attempt in a second overtime to win the game. The Bulldogs will need to essentially shut down the Crimson Tide offense and tire out the Alabama defense by keeping them on the field. Georgia wants to keep this a relatively low scoring game and if they are able to do so, it could get interesting. The key to success for the favored Alabama squad will be to complement their usually impenetrable defense. By doing that, quarterback Jalen Hurts, wide receiver Calvin Ridley and running backs Bo Scarbrough and Damien Harris will not feel a heightened pressure to score as much against their SEC foe. ESPN will provide a multitude of viewing options for consumers through its much-promoted MegaCast, which includes ten alternate platforms beside the traditional broadcast with analyst Kirk Herbstreit and play-by-play man Chris Fowler. 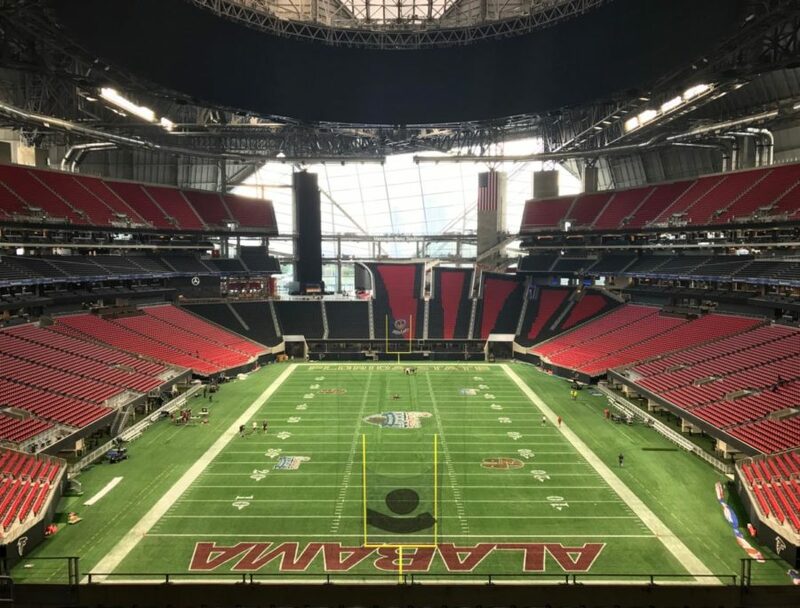 With the National Championship up for grabs in Atlanta tonight, President Trump will be in attendance, as will numerous dignitaries and celebrities. The halftime show, performed by Kendrick Lamar, may even prove more must-watch TV than the game itself, as a pointed political statement by the hip-hop superstar may be controversial. No matter the final score, the game tonight will definitely be worth your time.